What’s a soft opening? We looked that up as well, as The Overpass Merchants is only soft opened. Their “grand opening” is in July. A soft opening is sort of like a preview of a restaurant while the restaurant is testing out different things. (We remembered this definition from the movie, Ocean’s 13.). The point is to basically experiment and fix issues and to see what works and what doesn’t. 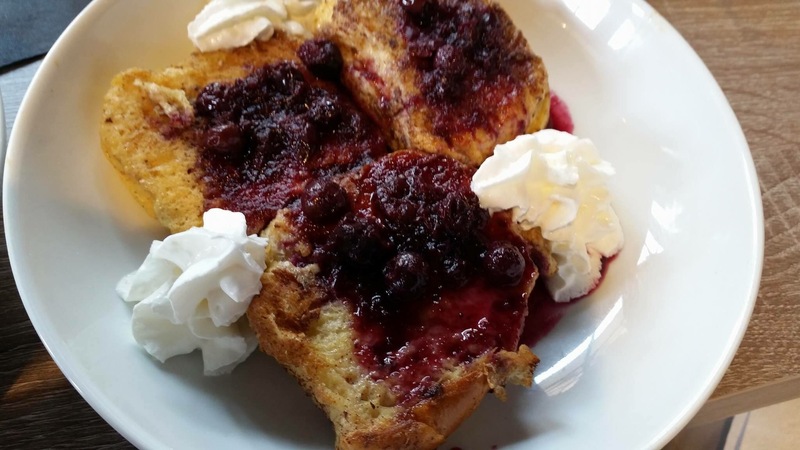 Is it fair to review the brunch of a gastropub that hasn’t had its grand opening? Are there rules when it comes to brunch and brunch reviews? Baton Rouge Brunches couldn’t resist and is glad we didn’t! 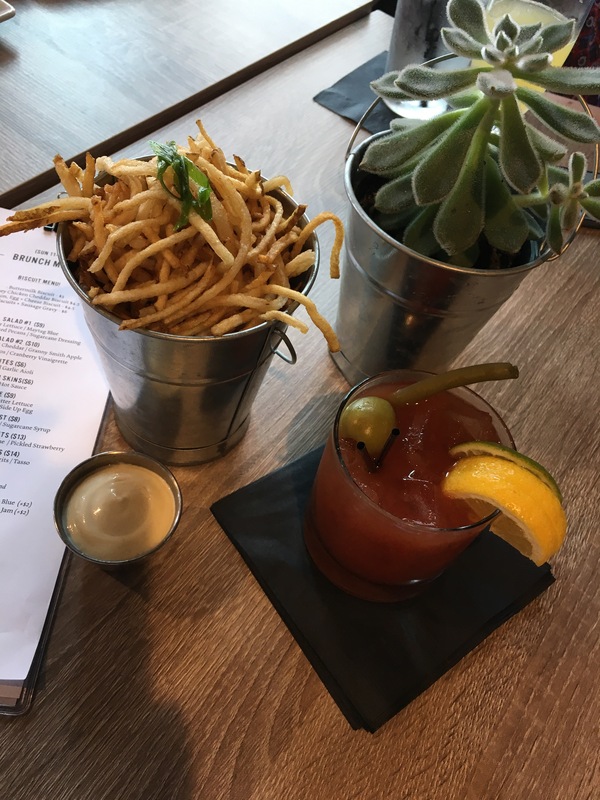 If this delicious brunch is what happens with a soft opening, then we can’t wait for the grand opening of The Overpass Merchant’s brunch. This brunch is designed for an appetite and for those who love bold and balanced flavors! There is a delicious Bloody Mary and Bottomless Mimosa. Both affordably and well priced. There is a wide selection of other beverages as well. Be advised, they don’t have coffee yet, but we were told that would be a future addition. Also, sometimes the mimosas came in champagne flutes and other times in pint glasses (no complaint there). 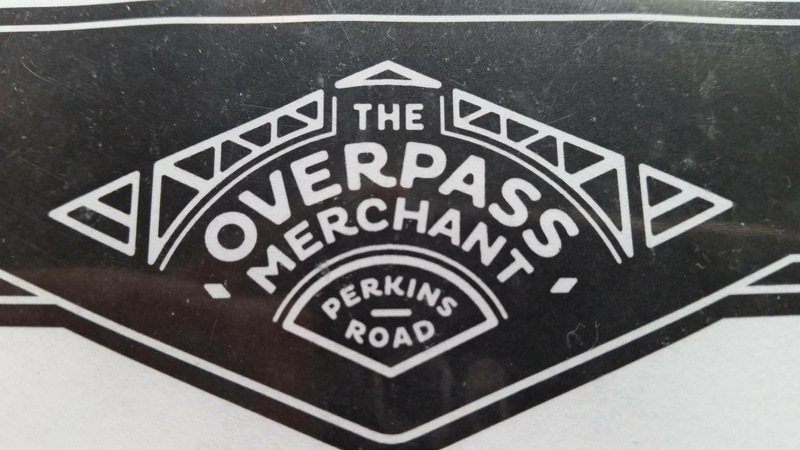 The Overpass Merchant is conveniently located at the foot of the Perkins Road overpass with ample outdoor and indoor seating. The patio is very open with lots of room. The interior of the restaurant is painted in a cool gray and neutral color scheme with large windows and anchored by a large, subway tiled bar. There is open seating with great music. It seems family friendly and there is plenty of space to dine at a table or to at the bar. 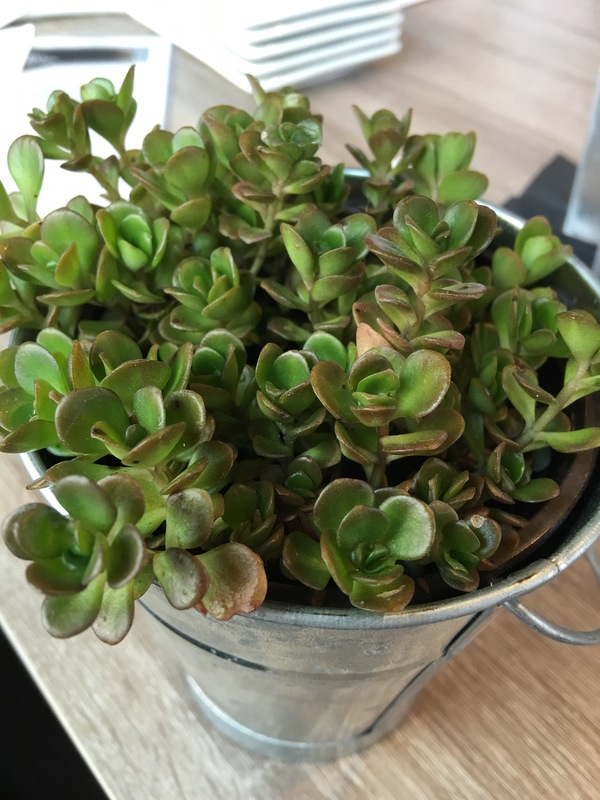 The table decor are succulent plants and is very earthy. The overpass is a little loud but not a deal breaker and not noticeable while inside. The menu doesn’t mince words. It’s well priced and fantastically portioned. There is a biscuit menu, salad options, and a selection of entrees that seemed to be designed for you to struggle with the decision of “what do we get?” Maybe the point is to get you to order several at once? 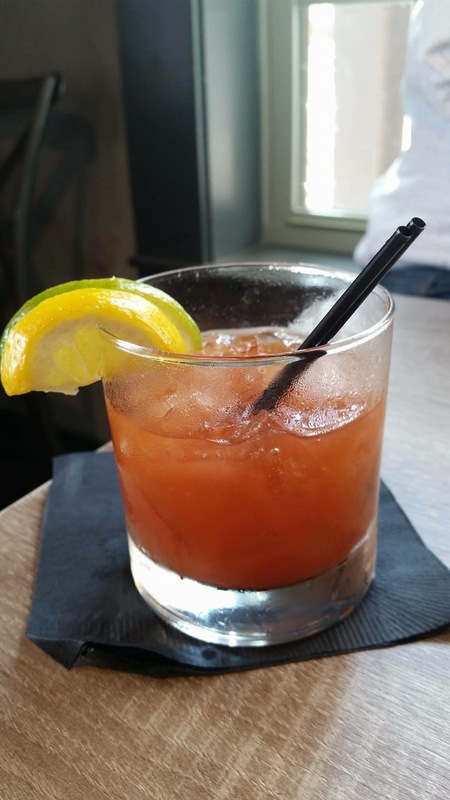 The beauty is that the menu is priced incredibly well and it leaves you seriously room to explore their drink menu and different options and combinations. 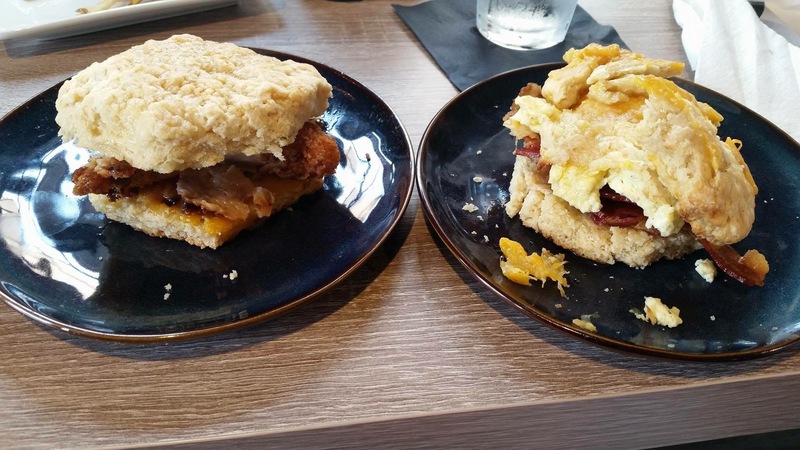 Truth be told, we thought the biscuits were the best part of the brunch experience. They were out of this world and there were several options to choose from. The biscuits are enormous with a subtle sweetness to their taste. 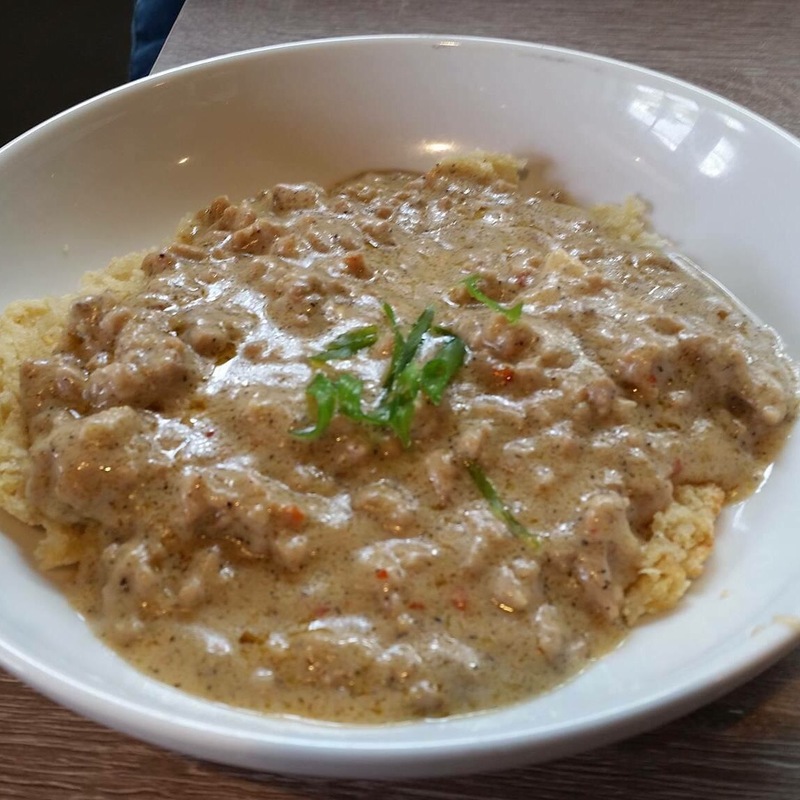 The sweetness blends well with the saltiness of bacon and the spice of the gravy. Loved this dish! It was spicy and sweet. The dish is served in a bowl which is actually very appropriate considering the amount of delicious gravy you are provided. It’s spicy, no doubt, and truly a great menu item. Could be an entree by itself. Do yourself a favor and order an extra biscuit to go with the dish. Oh my! Delicious! The bacon was crispy and on a sea of biscuit. Egg was cooked to perfection and the cheese was appropriately applied. Great menu option. The sweetness of the honey and biscuit combined with the fried chicken is outstanding. The cheddar is an afterthought but well balanced. Biscuit, again, is enormous! Made for sharing. The sauce is something special. 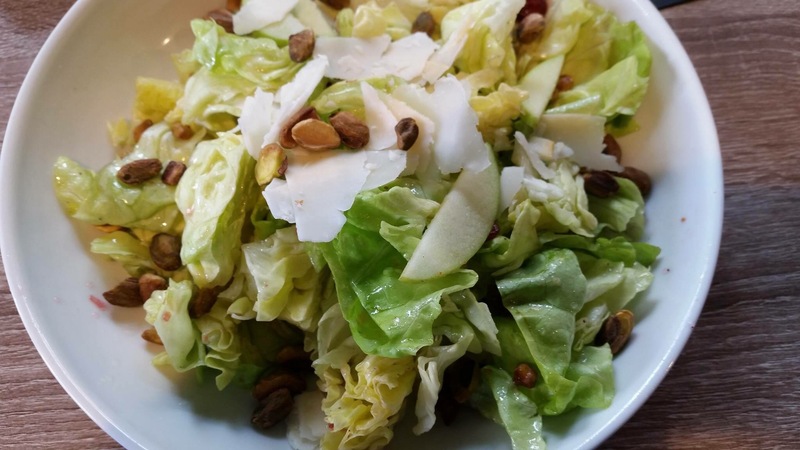 The salad options are a healthier and refreshing alternative to the other brunch items. It was decent enough and shareable. We aren’t down on the salad just felt like it was sort of missing something. It was good nonetheless. Bold statement coming your way. Perhaps one of the best brunch burgers in Baton Rouge. The burger is a chuck, brisket, and short rib blend. Bread bun is sweet and a game changer! Add an egg and crispy bacon to your burger for a minimal charge– you are welcomed! 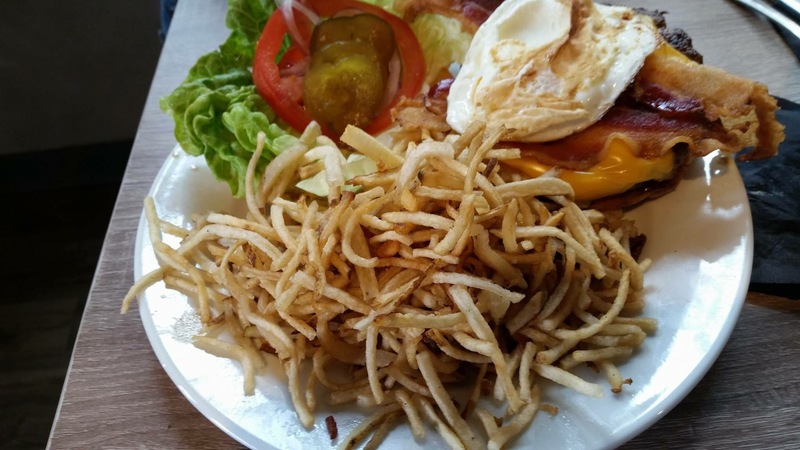 This burger will haunt your Sunday brunch experience! Haunt you like the butter pickles that were on the burger. We noticed those too! 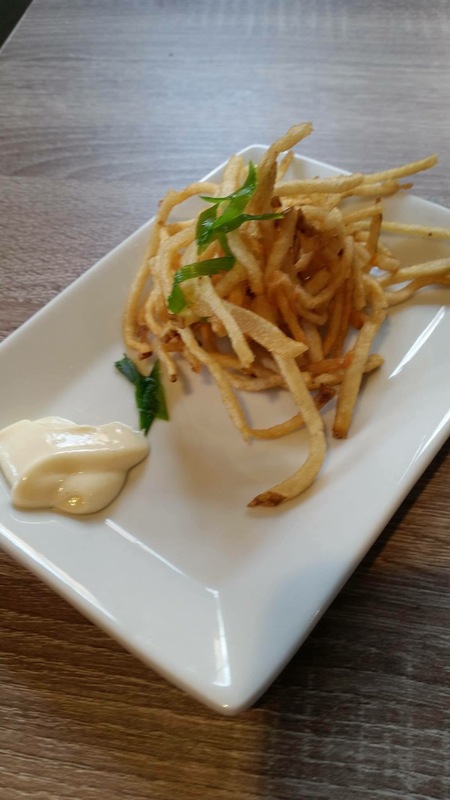 It comes with a wonderful portion of frites. Seriously a great burger and at a great price! Who has the audacity to pair goat cheese and grits?! A genius, that’s who! 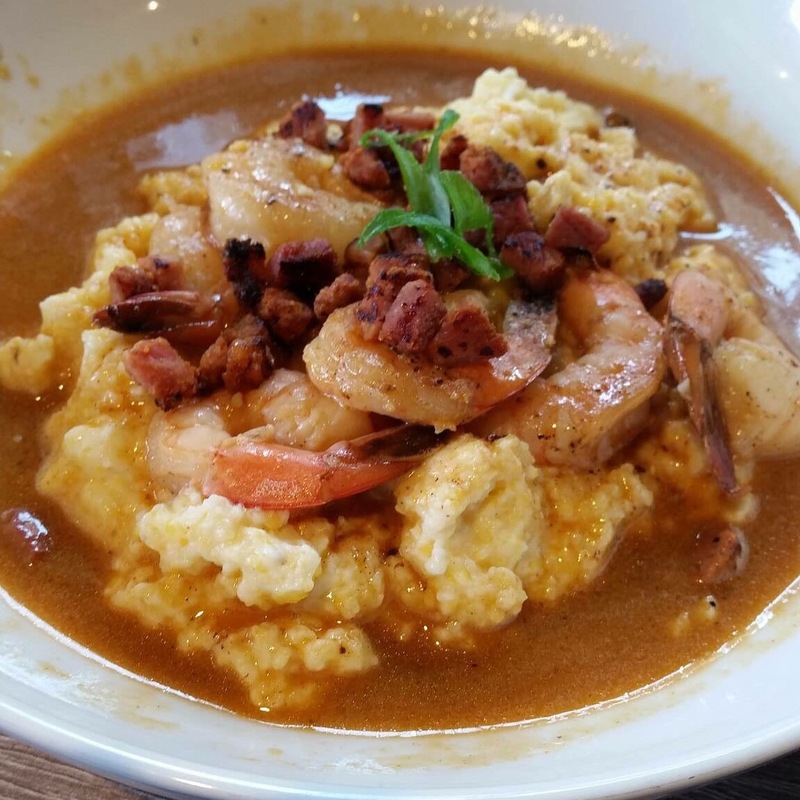 These grits are perfect and the shrimp are huge. Tasso is a great complement to the dish. The sauce could be a little thicker but it isn’t a deal breaker. We suggest asking for a thick sauce. Blueberries. Whip cream. Syrup. This is an extremely well balanced dish. You almost don’t need the syrup, the rest is sweet enough. Ask them to make it crispy if you aren’t a fan of bread soaking up the succulent, sweet, goodness of a blueberry sauce to the point of soggy. We like soggy when it comes to syrup and sauces! A great entree and a must try! This entree is another balancing act of sweet, salty, and crispy. The balance is both in flavor and texture. It is a beautiful dish and strawberries are a thoughtful addition. 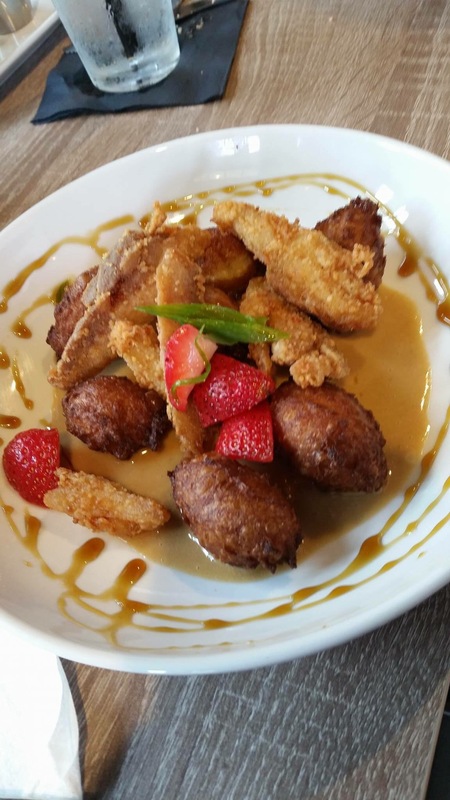 The chicken was crispy and the beignets are a twist on convention. Awesome dish! 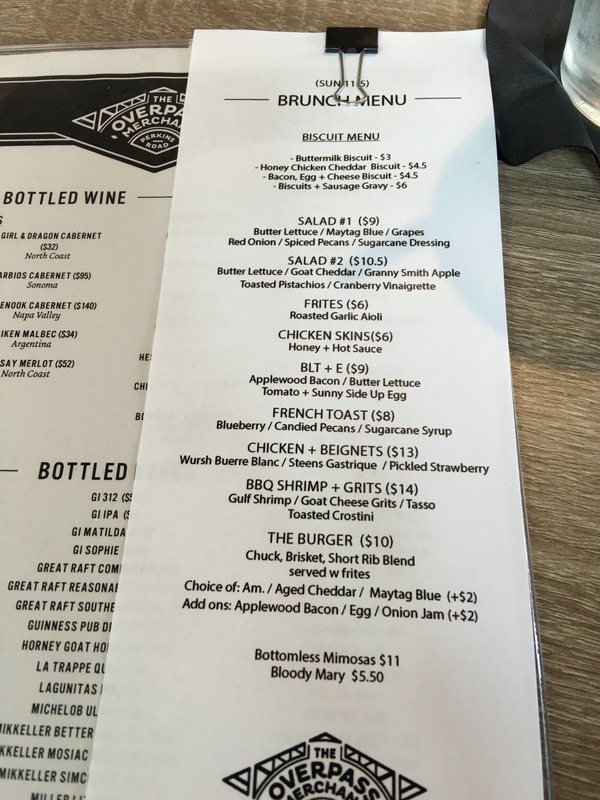 What are our overarching thoughts of The Overpass Merchant’s brunch? This place is all about balanced and bold flavors! Portion sizes are generous and fairly priced. We initially thought the bar would be the focus but we were mistaken. With time they will achieve perfection of execution and that makes for a great brunch. 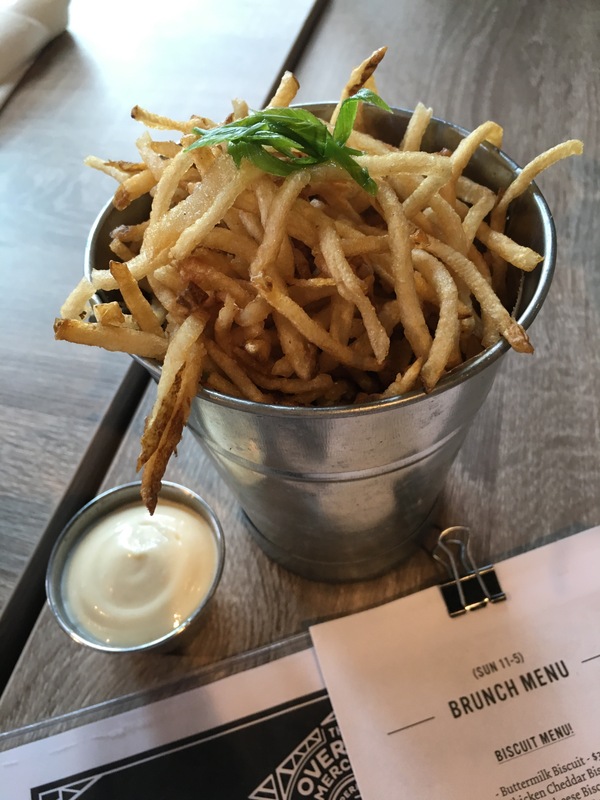 The are some stand out menu items that demand repeat performances and repeat trips to this new gastropub. Can’t wait for the grand opening but we may have to try the soft opening a few more times! Baton Rouge Brunches approves of The Overpass Merchant!